INKin' All Night! 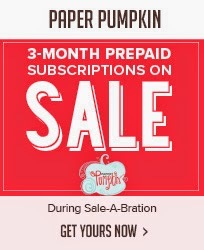 : Paper Pumpkin on sale! 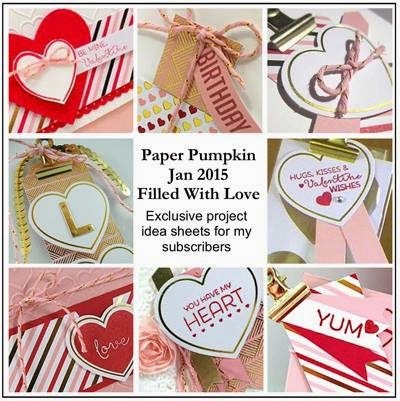 Have you ever thought about trying out our "Paper Pumpkin" subscription service? It's a once a month box of creativity delivered right to your front door! Intended for stampers and crafters of any experience level! It comes complete with every thing you need except add your own scissors and adhesive! Exclusive stamp sets that are only available through these Paper Pumpkin orders! Instructions and samples, even an online video to walk you through it! And we have a 3 month subscription On Sale Now and it qualifies for your choice of a FREE Sale-a-Bration item too!! There's no obligation after these 3 months if you change your mind, but my guess is that you'll love it and want to continue on a month by month basis or purchase another subscription! At any time you can adjust your subscription to skip a month if needed too, no penalties - you are in charge, you decide! And for anyone that subscribes through me, I have teamed up with a few fellow demonstrators and we collectively create a Subscriber Only-Additional Projects PDF complete with photos, supplies list and step by step instructions to give you alternate ideas for each monthly kit! Here's a teaser of a few of the January projects! And Oh My Gosh, head over to Pinterest to My Paper Pumpkin board or Stampin' Up's MPP Board and there will be enough ideas to keep you entertained!! And as a special perk, refill kits and prior kits if you missed any are available only to subscribers while supplies last. If you have ANY questions, please contact me! I'm here to help you! Labels: Filled With Love, INKin' All Night!, My Paper Pumpkin, Sale-A-Bration, Stampin' Up! NEW Weekly Deals - Tie it Up! Spring Fling, ready set go! Pop of gold or vintage lace?